So explains ‘The Ballad of Jesse James’, which tells us of the great man, and how he stole from the rich and gave to the poor, but was killed by ‘that dirty little coward’ Robert Ford. But in Andrew Dominik’s remarkable film we the story from another perspective: that of a man who, like so many of his time, was fixated by this cult hero, but also a man whom history has deemed destined for infamy. As is obvious from the title, the film focuses on the last chapter of the life of Jesse James, and the events leading up to his death. Indeed, the title is integral to the film’s central thesis, so important in fact that star Brad Pitt stipulated in his contract that the full-length title of Ron Hansen’s 1983 source novel had to remain if he was to work on the project. That the title reveals the key event of the film is not the point; anyone with a knowledge of the legend or the famous song knows what will inevitably happen in the narrative. What is key to the long-winded title, and the film itself, is the ‘coward’ himself, Robert Ford. Who was he, what motivated his actions, and is he deserving of his widespread notoriety? And how does this reflect back on our opinion of the ‘heroic’ Jesse James himself? We join the story as Jesse and his gang embark on a large-scale train robbery. Here we see the ‘hero’ in action: violent, brutal, unpredictable and seemingly out-of-control. From the outset, the myth of the brave, moral figure is being deconstructed. We are introduced to the young, 19 year old Robert Ford, starstruck to be alongside the great man himself, and who practically begs to be let in with an almost embarrassing sense of desparation. Nevertheless, he is admitted into the group, and the ageing James appears to take a shine to the boy. 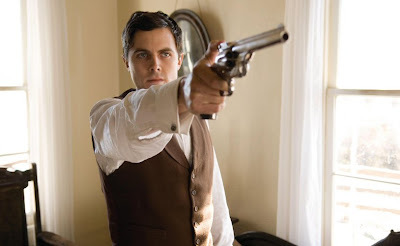 A superbly nuanced performance from Casey Affleck gives us all of this, and more. His Robert Ford is shy, awkward, twitchy, but equally determined to somehow prove his worth to the world. It is interesting that comparisons to both Judas and Mark Chapman have been made – both figures set about destroying icons they apparently revered, yet in doing so fed further into their mystiques. Ford is clearly obssessed with James, and has been since boyhood, and when he meets him at the start of the film is clearly in awe of him. And as he gains James’ confidence, this obssession grows deeper, darker, more disturbing. “Do you want to be like me, or do you want to be me?” James asks at one point. Whilst Ford is seen to live rather vicariously through his hero’s actions, Jesse James presents a much more contradictory character. He is shown from the outset to be violent, recklessly so at times; he pummels a young boy, supposedly to get information out of him, but gives him no chance to actually speak. This is in stark contrast to his seemingly loving home life – loving husband, and father to two young children. He can be equally charming and menacing, depending on the present company, or what he wants from a situation. I am no great fan of Brad Pitt; he is certainly no character actor, and his range is somewhat limited. But his Jesse James here is nigh-on perfect: charismatic and charming, yet enigmatic and elusive, we fittingly have here one of modern cinema’s modern icons playing one of America’s great mythical figures. The film addresses this early idea of celebrity; at one stage, James boasts that he is only one of two Americans known in Europe. I get the sense that this is a somewhat personal project of his: certainly the idea of ‘Brad Pitt’ the movie star, dwarfs both his off-screen persona, as well as his less-than-impressive on-screen body of work. Perhaps this is his riposte to the myth of the celebrity hero-worshipping culture we are increasingly witness nowadays. As the story unfolds, and characters are crossed and double-crossed, we begin our march towards the inevitable outcome described in the film’s title. But as the film goes on, we see James grow more and more weary with life, and seems to be embracing more and more the idea of death. On a frozen lake, he confides to Ford’s brother of having been “to the edge” of living, and not wanting to come back. Like Jesus’ embracing of what Judas was to do, he mysteriously seems to know what Robert Ford must do, and does nothing to stop it. “You’re going to break a lot of hearts” he tells him, Ford not fully comprehending the meaning of this. As well as the two fantastic central perfomances, of note is the superb cinematography, which captures the epic sweep of the Wild West setting, and used cleverly to chart the passing of time through the changing of the seasons. British DP Roger Deakins, a regular collaborator of the Coen brothers’, captures the snow-covered landscapes and rolling fields of wheat with equal panache as he does the dimly lit interiors of houses. Nick Cave and Warren Ellis reprise their excellent work on The Proposition with a suitably restrained score, which punctuates the film’s running time nicely. Mentioning the running time, this is a long film, but never feels as long as its 160 minutes, which seem to whisk by. Critics have complained that director Dominik is too generous with his lingering shot lengths, but i felt it matched the tone of the film perfectly. The film has been a flop at the US box-office, so far grossing only $3 million on its budget of $30 million, despite the generally positive reviews and the presence of Mr. Pitt, and this does not surprise me; i can imagine that the long title of the film is enough to put off a significant portion of the mainstream audience. But for those who do see it, The Assassination of Jesse James by the Coward Robert Ford is a richly rewarding experience, an impossible film to fault, and one whose ideas, images and emotions linger for some time.